How do you plan a successful wedding? 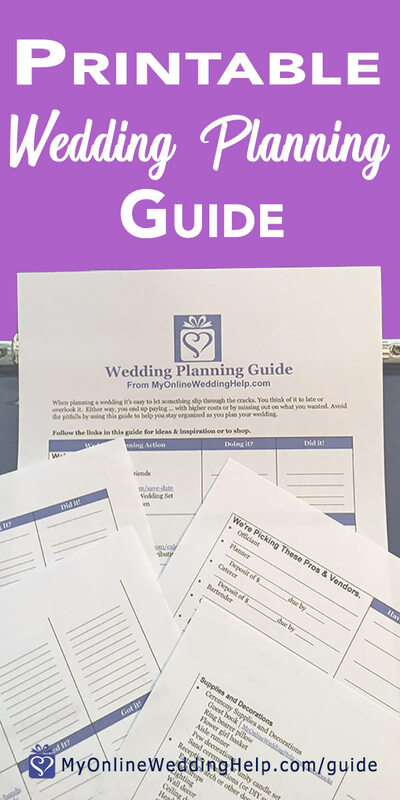 You avoid the pitfalls by using a wedding planning guide. This one is free, printable, and helps you stay organized. Here’s a bit about the steps you’ll find inside the guide. Soon after the engagement you will announce the engagement and set the date. Early activities also include setting a budget and asking the wedding party (see bridesmaids proposal ideas here). Agreeing on the number of guests and choosing a venue are also important. Follow My Online Wedding Help on Pinterest! Range of boards from wedding ideas and tips for planning a wedding on a budget to DIY and rustic wedding inspiration. You will be juggling a variety of potential professionals and service providers. Here is space for deciding which are right for you and noting deposits and due dates. The projects that friends, family, and you will do fall under DIY. Use this checklist to plan those activities. The whole affair also involves a lot of shopping. Wedding bands; printed invitations and other wedding paper, and the wedding party ensembles begin the list. “Shop ’til you drop” may become your motto as you get ceremony and reception supplies and decor. And don’t forget the wedding party gifts! Check out 25 Bridesmaids Ideas here. There are also important, miscellaneous tasks to complete. For example, finalizing the guest list, making a seating plan, and planning the rehearsal dinner. Check them off and make notes as you complete each. It’s down to the wire and it’s important nothing slips through the cracks! Track all the details here, from following up with vendors and the wedding party, to organizing cash tips, and a lot more. The day before, tick off the items that will make your big day worry free. Subscribe to our email list and you will receive informative articles, administrative notices, and occasional product promotions as well as the free guide. To prevent sign-up fraud, we use double opt-in. Please click the verification link in your confirmation email. You can unsubscribe at any time. Learn more about our privacy and cookies policy.